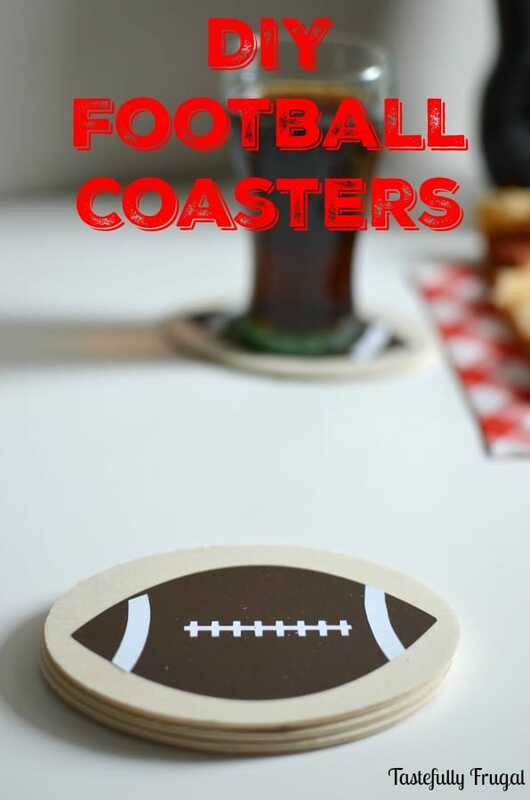 Make these fun football coasters to protect your tables from drink rings in minutes. As you probably already know by now I love having parties and entertaining guests. From the food to the games to the fun memories made I love everything involved with having friends over. The only thing I don’t like about parties is the clean up. Now that football season is in full swing, and the big game is a month away, we are having get togethers with friends at least once a week. 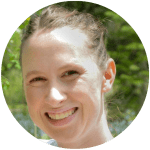 I’ve made some changes to our typical party plans to make clean up easier but one of the my biggest pet peeves was still happening; water rings on the table. We had a set of really nice coasters my husband got from his work one year but somehow they have gone missing. So I decided to make my own. 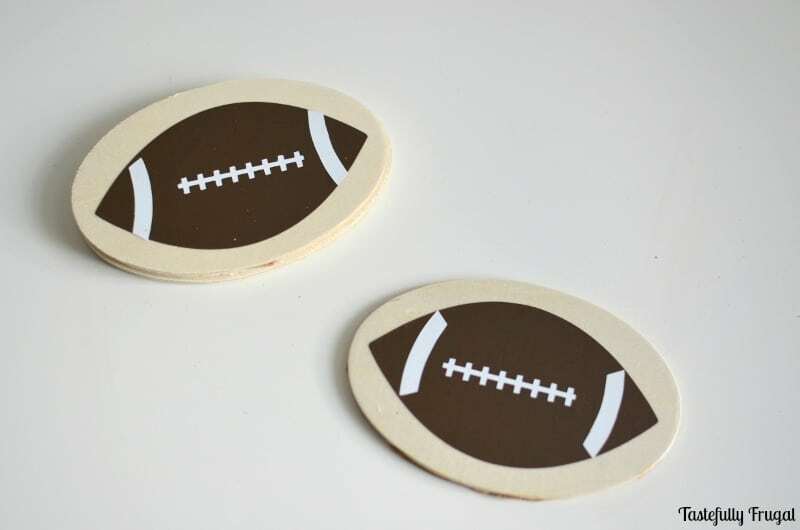 And since most of our parties for the next month or so will be revolving around football I decided to make football shaped coasters. They were SO easy to make. Place football stickers on one side of the oval shape. 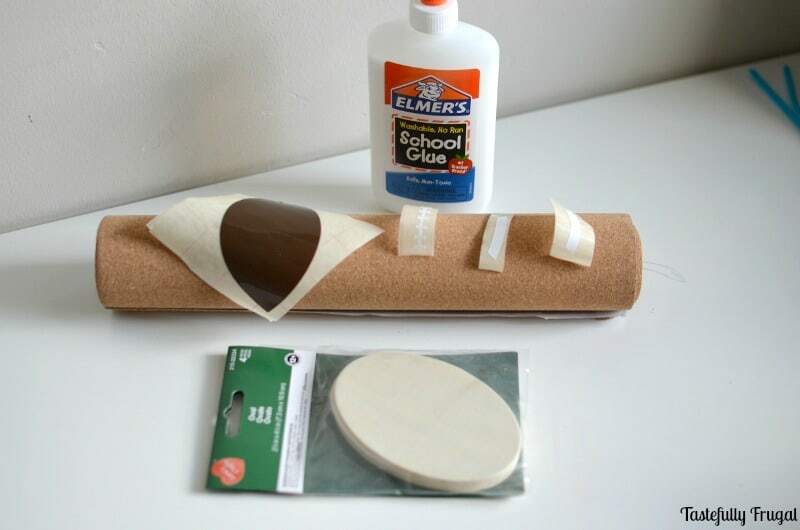 Cut your cork to just smaller than your oval and glue on to the other side of oval. 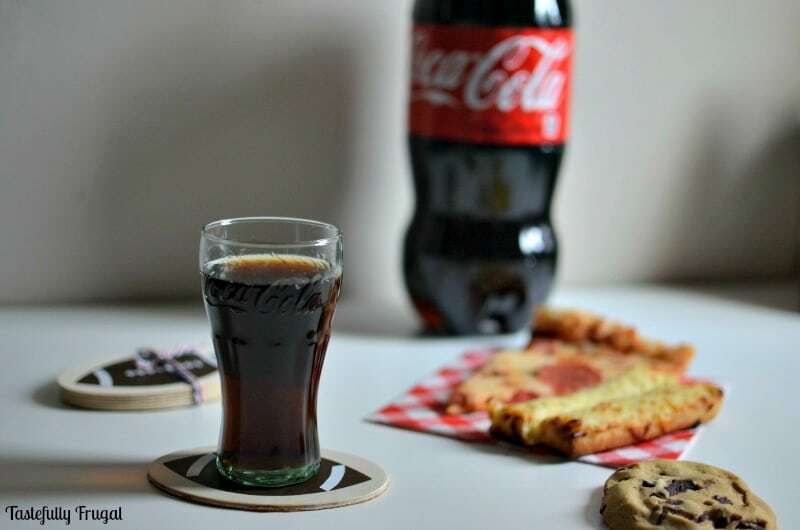 Place drink on coaster and don’t worry about water rings damaging your tables anymore. These would make a great hostess gift too. 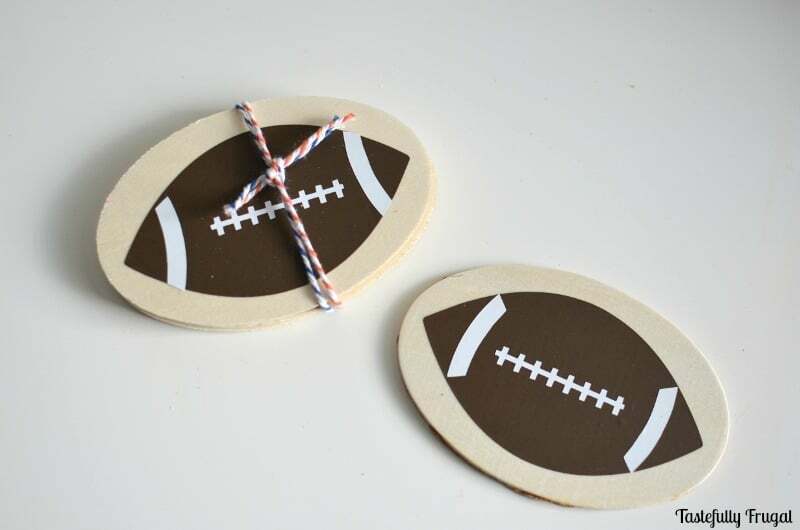 Just tie them together with some bakers twine in your favorite team’s colors. Like I mentioned earlier we are getting together every weekend with a few friends and sometimes planning a full party spread or meal slips my mind if it’s been a crazy week. Last week was one of those weeks. I was at Sam’s Club picking up a few things when my husband called to remind me our friends would be to our house in an hour and asked if he needed me to get anything ready. I had totally spaced it and was scrambling. That’s when I saw this sign for the Coca-Cola and Pizza Combo at the in-club cafe. 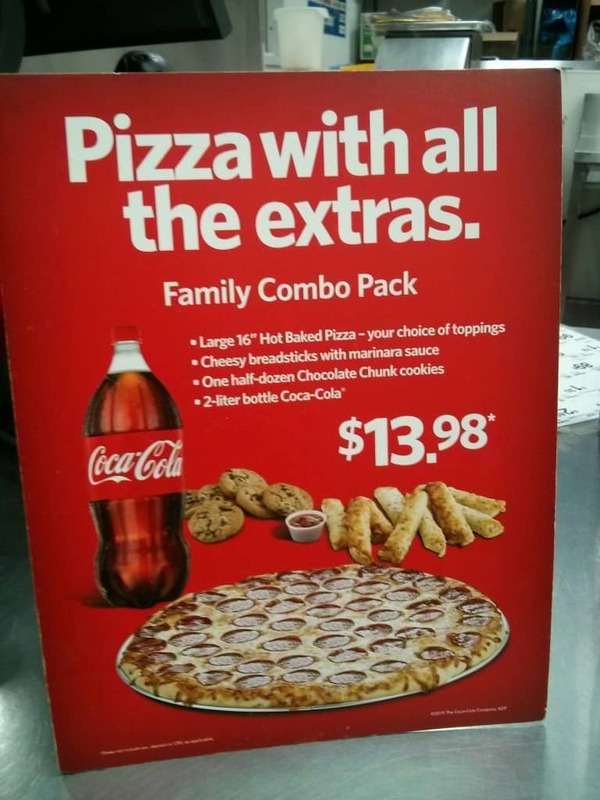 It included a 16 in pizza, breadsticks, cookies and a 2 liter of Coca-Cola. The best part was I ordered it, finished my shopping, picked it up and was ready to serve as soon as I got home (which was perfect because our guests showed up at the same time I was walking in the door). Bonus they helped carry groceries in! We were all set to watch the games that night. Dinner and dessert were delicious, clean up was a breeze and no water marks on my coffee table thanks to my new coasters. Are you excited for the big game coming up? Do you watch for the game, commercials or both?! These coasters are so way cute!! 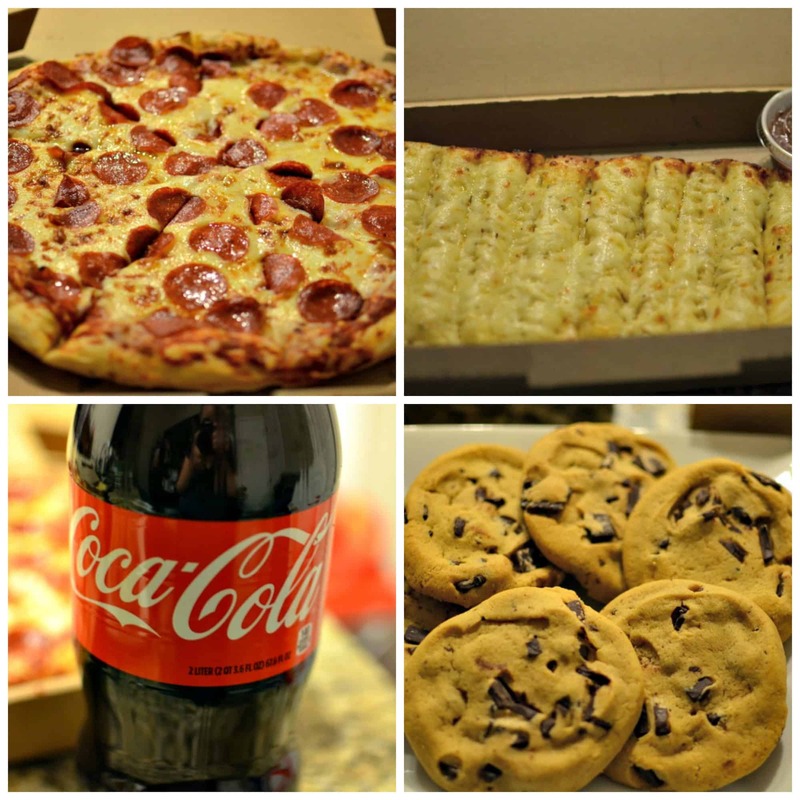 And that Pizza Combo looks delicious, too, so perfect for celebrating the game in an easy, delicious way! I love football for the game, but the commercials are always a bonus!